In the kingdom of Sempera, time is currency—extracted from blood, bound to iron, and consumed to add time to one’s own lifespan. The rich aristocracy, like the Gerlings, tax the poor to the hilt, extending their own lives by centuries. No one resents the Gerlings more than Jules Ember. A decade ago, she and her father were servants at Everless, the Gerlings’ palatial estate, until a fateful accident forced them to flee in the dead of night. When Jules discovers that her father is dying, she knows that she must return to Everless to earn more time for him before she loses him forever. But going back to Everless brings more danger—and temptation—than Jules could have ever imagined. Soon she’s caught in a tangle of violent secrets and finds her heart torn between two people she thought she’d never see again. Her decisions have the power to change her fate—and the fate of time itself. Jules goes to Everless to make some money. The Queen arrives and Jules befriends Caro and Ina. Jules goes to Briarsmoor and realises that she and Ina are twins, and that the Queen took the wrong child, thinking that this would give her her heart back. Jules is the child that she wanted, though. It turns out that Caro is actually the Sorceress, not the Queen, and Jules is another incarnation of the Alchemist. Caro kills Roan and imprisons Jules, but Liam helps Jules escape. Jules and her father were banished from Everless, the palace that the Gerling family own. This is because Liam Gerling pushed his brother Roan into a fire, and Jules saved him. Then the place burnt down. Oops. So Jules and her father went on the run. At the beginning of the book, Jules is catching fish to sell at the market. She goes to the market, and sees her friend Amma, who tells her that she is planning on working at Everless for the next few months in order to earn time. Time is a currency in this world, in case you couldn’t remember. Anyway, Jules returns to her father, who is being visited by the guy he owes rent to. Jules’ father is two months behind, and the guy asks for four months’ worth of time. Jules protests and says she will go to work at Everless for Lord Roan’s wedding to Ina Gold, the Queen’s daughter, and earn a year for every month she works. The rent collector agrees but Jules’ father doesn’t want her to go. Of course, Jules lies to her father and goes to work at the palace anyway. Jules hears the story of the Alchemist and the Sorceress. Apparently the two were imprisoned by a greedy lord who wanted time. The Alchemist found a way to take time from blood. Eventually, he poisoned the lord and he and the Sorceress escaped. The Sorceress found out that the Alchemist used her immortality to kill the lord. She tells the Alchemist she wants her immortality back, and the Alchemist steals her heart. She kills the Alchemist. Jules takes a tray to Lady Sida, who’s super old. She says that she thinks the Queen eats people’s hearts in order to stay young, and that she ate her previous adopted children’s hearts. Roan Gerling winks at Jules during a party. This is probably important. She thinks he recognised her. Jules comes across her old friend, Tam, who is now unable to speak. Jules’ father arrives at Everless. He wants her to go back with him. He says it’s dangerous for her there. He tells Jules not to let the Queen see her. The Queen arrives at Everless. Addie is meant to be her handmaiden. The Queen falls and Addie catches her by the arm. This is forbidden, so Addie is banished. Hinton was supposed to be taking care of Jules’ father but he loses him. When he finds him again, his hands are stained with mava, and Hinton thinks he tried to steal something from the Gerling vault. Jules’ father is now dead. Jules recalls the Ghost from Crofton, who was a gambler and gambled with his son’s time as well as his own. His son died, and the Ghost wandered around in dark alleyways with two centuries of time in him. Jules listens through the wall and hears that the Queen was attacked on her way to Everless. Jules looks at the drawing of her mother. She sees that something is written in an ancient language on the back. It says something about a fox and a snake who were best friends. Jules recalls her father telling her this story as a child. Jules returns to Crofton to retrieve her father’s things from the time lender. It turns out that her father’s debts have been paid, and all her father has left her is a letter, which says that she is not his biological daughter. Jules visits the library back at Everless and starts to read a book titled Sempera: Histories. She spots Liam Gerling and sees that his hands are stained purple. She follows him to the vault and he sees her. He realises who she is. He tells her that if anyone other than a Gerling were to try to get into the vault, it would take their time. Roan Gerling comes across Jules and he also recognises her. He agrees to put in a good word for her with the Queen’s handmaiden, Cora. Liam Gerling punishes Jules by having her shell mava. He comes to see her and helps her shell it. Roan shows up and interrupts what I’m sure was going to be an interesting conversation. Roan takes Jules to Cora and Ina Gold. Ina tells Jules that Caro set her and Roan up after she found out they were sending letters to one another. Caro approves of Jules and takes her to the Queen. The Queen throws a knife at Ina, and Jules jumps in between to protect her. Caro catches the knife. This was part of a test. Caro tells Jules about ice holly, which is apparently really rare. There’s some in the Everless gardens, and the Queen orders that it be picked. Jules tells Caro about the vault and Caro offers to look inside in return for Jules’ help. Caro wants Jules to tell her if Roan does anything dodgy. Jules spots Roan waiting for Bea. They’re obviously sleeping together. The Queen and Caro leave the palace briefly. Ina and Jules go and visit an orphanage. Ina is determined to find out who her birth parents are. She tells Jules that the Queen is obsessed with the Sorceress. Jules talks to one of the people at the orphanage. He tells her that there are few records from the year of the time tremors – the year both Jules and Ina were abandoned. He tells her about a town called Briarsmoor that is twelve hours behind the rest of the kingdom because time once froze there. Jules brings Briarsmoor up with Ina, who says she is forbidden from visiting it. Jules wonders if she was born in Briarsmoor and is therefore cursed like the man said. 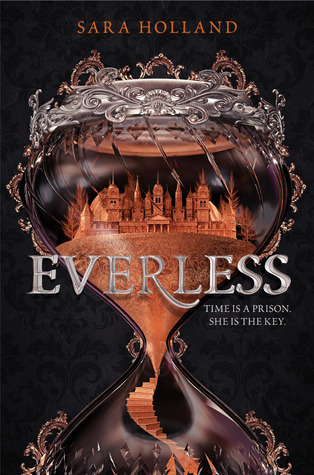 The Queen returns to Everless. Jules visits her and for some reason she looks like the town drunk. Cora arrives and lays her hand on the Queen’s heart, which seems to improve her health slightly. Cora tells Jules that the Queen will soon die, Ina will be married, and Sempera will have a new ruler. Cora, Ina, and Jules go to celebrate in a tavern. Ina suggests that Jules could be one of the children from Briarsmoor and they should convince the Queen to take them there. Jules comes across Addie, who tells Jules that when she touched the Queen as she was falling she was ice cold. Addie felt like her life was drifting away – worse than getting her time drawn. Addie tells Jules that Liam saved her. Liam shows up and tells Jules that she isn’t remembering their childhood correctly. He tells her that the Queen isn’t dying. He tells her to remember the stories from her childhood. Cora, Jules, and Ina go to see a hedge witch. Jules goes into some sort of trance and starts speaking in an unknown language. Caro decides to look in the vault. She is caught, and Ivan is to take forty years off her. Jules goes to a time lender and asks him to take forty years so she can give them to Caro. The time lender is creeped out by Jules because her time doesn’t burn out. He takes the time from her though. Jules gets Caro to drink the time. The time becomes a gold sphere and Caro starts to choke on it. It then melts and goes back into Jules. Jules realises that Caro didn’t actually enter the vault because her hands are clean. Jules goes into the vault and finds the name Antonia Ivera in a book. This seems important. Jules goes to Briarsmoor, leaving the book behind. Jules comes across Rinn, a Briarsmoor resident who is caught in a time loop. She tells Jules about Naomi Morse, who was Jules’ mother, and Jules’ father, Ezra, who knew a tonne of stuff about time and could slow it down. Rinn says that Naomi had twins, and one was born with a stone in its mouth, which is apparently an omen. Time stopped when these twins were born. The man who raised Jules was actually her uncle. Jules thinks that the Queen is the Sorceress and wanted a child who could stop time, so she took Ina from Briarsmoor. Unfortunately, she seems to have taken the wrong twin. Liam finds Jules and takes her to Ambergris, and tells her to disappear. Jules realises that Liam saw her stop time to save Roan and he got her out of the estate to keep all that a secret. Liam thinks that the Sorceress and the Alchemist are both still around. He tells Jules that she is the Alchemist and the Queen is the Sorceress. The Queen currently thinks that Ina is the Alchemist. Jules freezes Liam and his crew and rushes back to the estate. Jules finds Caro and tries to warn her about the Queen, but Caro cuts her off. Caro says she has been manipulating the Queen for decades. She knows that Jules is the Alchemist, and calls her by her real name – Antonia. Caro is the Sorceress. Caro plans on telling everyone that Jules seduced Roan, and then murdered both him and the Queen. Caro kills Roan because she thinks that by killing someone that Jules loves, Jules will give her her heart. Fortunately, nothing happens. Jules didn’t really love Roan. Liam comes to rescue Jules from the dungeons. She decides to hide until she’s learnt to use her powers.